I’m writing this blog post a lot later than I would have liked – sorry. The reasons are surely good ones however; I was so busy when I got back packing orders and following up leads! Six weeks later things have calmed down enough for me to sit down and get some words down. I arrived into Kings Cross and after a minor issue with a luggage trolley (why won’t they accept the new £1 coins, wahhh?!) was safely installed in a black cab and en route to Olympia. I met my incredible step-sister Lucy outside who not only helped me set up the stand but also stayed for the three days! She’s great and I owe her wine for ever more. The stand set up was the bit I was dreading. I had created a to-scale drawing of my stand but I was so scared I had calculated something incorrectly, brought the wrong screws, would fall off the ladder etc etc. Anyway, we started by hanging the sign. Perhaps it was because our combined drill skills were none existent but this took way longer than necessary! Finally though, the sign was up. As this was Friday evening & we had the whole of Saturday set aside for setting up, we measured and marked up the shelving for my greeting cards and then sloped off for a large wine. I should say that Lucy and I stayed in a lovely Airbnb not far from Olympia. Having our own flat where we could cook meals and relax in was, in hindsight a godsend! 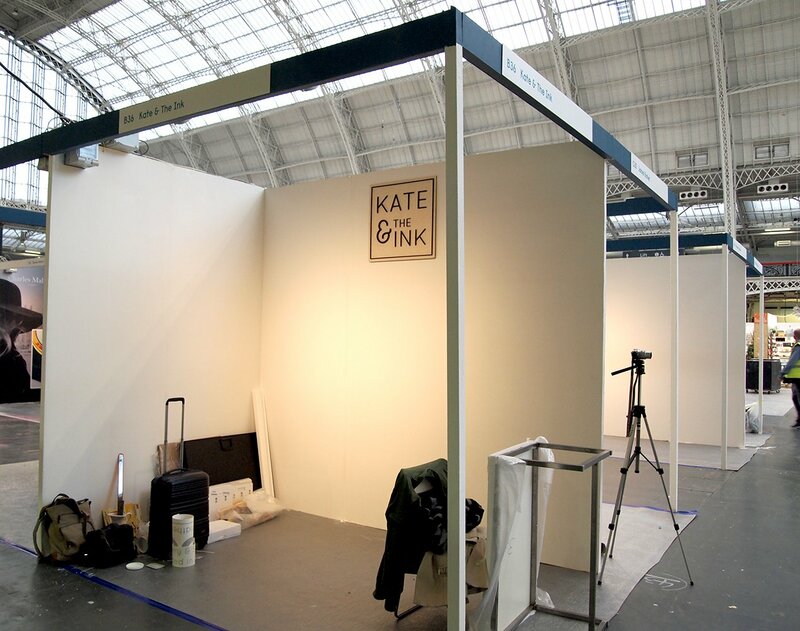 The setting up on Saturday went very smoothly apart from the dreaded vinyl lettering! I learned that there really is an art to applying vinyl lettering. You need a steady hand, the patience of a saint and always have a spare copy! I was VERY relieved that I had ordered two copies of all my vinyl. We also had loads of time which was great. The stand finally came together at about 3pm on Saturday. Lucy and I then went for a lovely manicure at Westfields because you know, your nails need to look the part. A side note, I had never visited Westfields before. WOW. Sunday morning and it was showtime! We arrived with plenty of time to spare so that we could arrange fresh tulips on the stand and get an obligatory coffee. At 10am, the show opened and the visitors started to come in. Some of my very first stand visitors were Sarah, Claire and Rachael from Pencil Me In and it was so lovely to see some friendly faces! On Sunday, we met a lot of retailers from small independent shops. I now know that these buyers tend to visit shows on their day off which I hadn’t realised before Pulse (not rocket science but good to know!). We took quite a few direct orders on the Sunday which again I hadn’t expected but was a great boost! For me the Monday and Tuesday were quieter days in terms of footfall but I met buyers from bigger retailers. While these buyers weren’t looking to place direct orders, they were keen to follow up after the show. Some of these have turned into exciting prospects which I can’t wait to share. 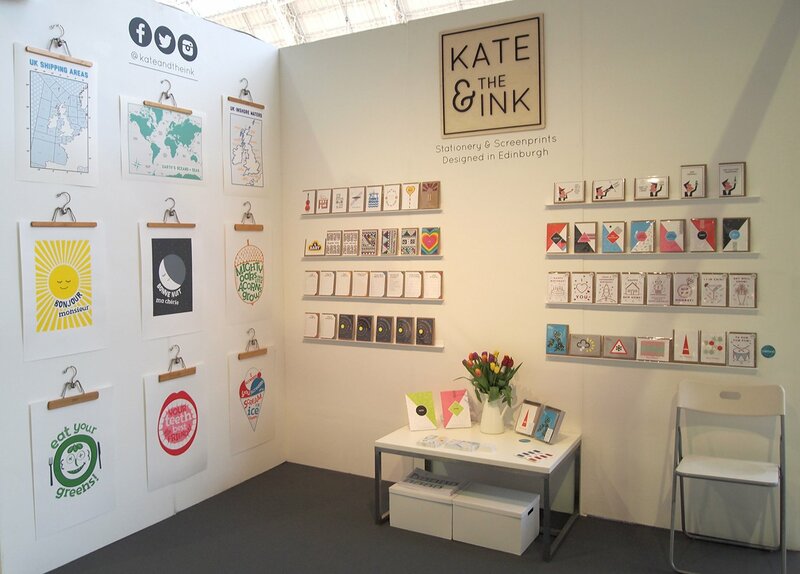 So on reflection of my tradefair debut, I was very pleased with how well my new 3D card range was received. For those reading who haven’t seen these yet, they are all designed to pop when seen through the included 3D glasses. They are all available in my (new!) Not On The High Street store. 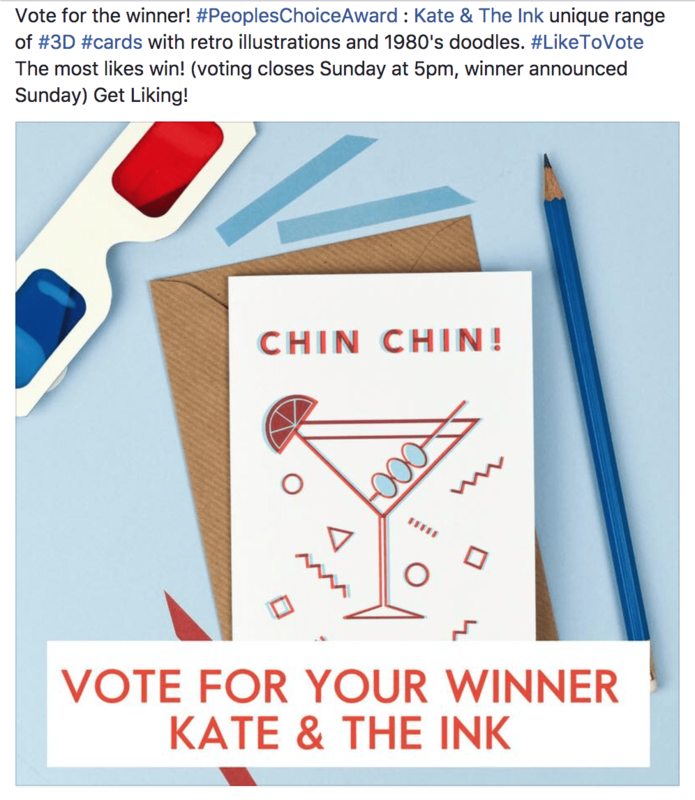 I was very pleased to be nominated alongside 6 other makers for the Pulse People’s Choice Award for my ‘Chin Chin’ card. While I didn’t take home the final prize, I was so delighted to have been nominated from over 200 entries! Other popular designs for retailers included my new 80’s card range, around the sun anniversary cards and bonjour/bonne nuit screenprints. I plan to add a stockist page to my website shortly. If you are a shop, big or small and would be interested in stocking my products please get in touch! The month after the show was spent packing orders and following up leads (I’m still doing the latter). I’m generally so happy with how it went. I’m really looking forward to my next one. 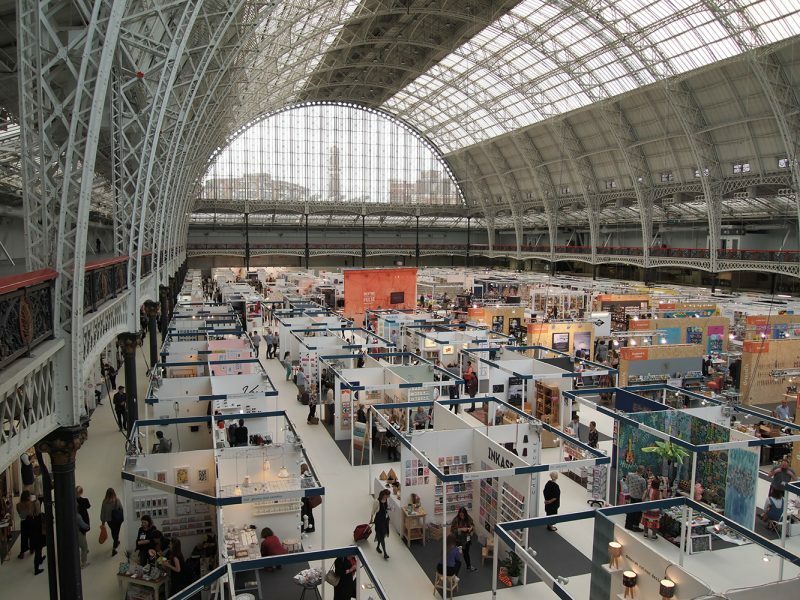 Today seems an ideal day to publish this blog post because I have literally just signed up for Top Drawer, being held at Olympia between 14th – 16th January 2018. More on that another time!